So believes San Clemente resident and Tai Chi/Qi Gong teacher, Tais Hoffman. It is a creed, one among many, intricately woven into the fabric of her life. This particular truism was first sown when as a wife and stay-at-home mom yearning for a more fulfilled life, Hoffman became a ready student who decided to enroll in an adult education Hatha Yoga class in San Diego, CA. After several years’ involvement in this practice, Hoffman’s love for the movements, coupled with the urgings of her teacher, encouraged her to seek certification as a Yoga Instructor. It was the right time to make the frightening leap from student to teacher, and she traveled to Tecate, Mexico to receive certification from renowned Yoga teacher Indra Devi. Simultaneously a heart-breaking divorce wrenched her life, and upon acquiring her certification Tais took an even larger step of faith, deciding to open her own Boutique and Yoga Studio in Escondido, CA. Seeking solace and a new perspective on her devastated life, Hoffman joined a local Ashram. Soon after, closing down her four-year-old studio, she began working full time as an Assistant Activities Director for a state-funded program for schizophrenics, while continuing to attend the Ashram evenings and on weekends. While working and attending the Ashram, Hoffman, the ever-seeking student, discovered another ancient movement practice. It was called Tai Chi, a moving form of Yoga combined with meditation. Similar, yet somewhat different from Yoga, it was a practice she was understandably drawn to. Hoffman’s life tapestry was expanding, and the colors multiplying. The student was readying herself to become the fit master for others … working daily in the corporate world, teaching Yoga/ Creative Movement part time, continuing to learn and practice Tai Chi, and attending the Ashram during her off time. Before long an unexpected split took place in the Ashram, and half the members relocated to Long Beach, CA. In order to remain under the instruction of a favored teacher, Tais moved with them. Settling in there she immediately began teaching Yoga part time. Her first teaching jobs involved a healthy back class at Long Beach Hospital and a 32-minute lunch break Yoga class for the employees of McDonnell Douglas Corporation. For the next few years Tais continued living and working in Long Beach, attending the Ashram, learning and practicing Tai Chi, and teaching Yoga in hospitals, recreation centers and at retreats. Then in the early ‘80s she was offered a job as Regional Volunteer Coordinator with the Catholic Conference in San Clemente, CA. At the same time a friend in Capistrano Beach, CA generously offered her room and board until she could find a place of her own and move into the area. Then, at the end of the ‘80s Hoffman decided it was time to get certified as a Tai Chi instructor. In 1987 she received certification with Tai Chi Chih originator Justin Stone and certification and training in Qi Gong with master instructor Roger Jahnke. Upon obtaining these certifications she stepped out in faith once again, deciding to leave the corporate world behind and pursue her desire to teach Tai Chi/Qi Gong full time. Since 1990 Tais Hoffman has been pursuing her love of Tai Chi and Qi Gong, building her classes. For the past five years she has been teaching 12 to 16 classes weekly in recreation centers, adult education programs, retirement communities, businesses, spas and at week-end retreats in San Clemente, as well as all over Southern California. Along with teaching these classes, she has developed a heart for mentoring women in the body, mind, spirit connection. 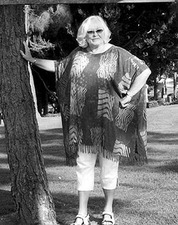 In that capacity she has conducted Wild Women’s workshops (helping women learn to laugh) at Pine Manor - a retreat center located on the Ortega Highway - and formed and facilitated women’s groups like Special Connections (a group for like-minded people) in her home, in recreation centers and at other local venues. Approaching her 70s and still going strong, Hoffman continues teaching Tai Chi/Qi Gong today in the San Clemente Parks and Recreation Program at the Community Center and at various other locations. She also holds a special outdoor, drop-in, donation only class in Pines Park, Capistrano Beach, on Monday mornings at 9 am. In addition she is in the midst of conducting her annual 12-week course based on the book the Artist’s Way by Julia Cameron. A course designed to awaken the artistic creativity she believes to be possessed by everyone in one form or another. Contact Tais Hoffman, 498-5711 for information regarding her classes.